Galerie Bing, Paris (by 1957). Sonia Delaunay, Paris (by 1973). Jean-Louis and Eric Delaunay, Paris (by descent from the above, by 1991). Acquired from the above by the present owners, August 2000. P. Francastel and G. Habasque, Robert Delaunay, Du cubisme à l'art abstrait, Paris, 1957, p. 298, no. 295. Paris, Galerie Denise René, Tendances de l'art abstrait, 1948. Ottawa, National Gallery of Canada, Robert, Sonia Delaunay, April 1965, no. 48 (illustrated). Paris, Musée Rodin, Sculptures de peintures, 1973, no. 47 (illustrated; titled Rythme). 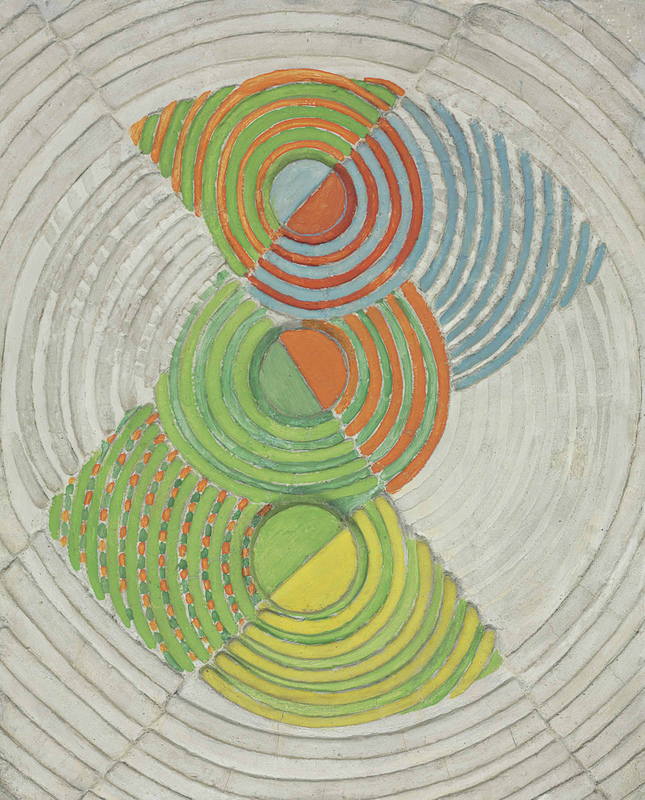 Paris, Musée de l'Orangerie des Tuileries and Staatliche Kunsthalle Baden-Baden, Robert Delaunay, May-November 1976, p. 116, no. 104 (illustrated, p. 117) and p. 202, no. 100 (illustrated in color, p. 201). Paris, Musée d'Art Moderne de la Ville de Paris, Robert, Sonia Delaunay, Le centenaire, May-September 1985, p. 129, no. 58. Kunstmuseum Bern, Künstlerpaare, Künstlerfreunde, Sonia and Robert Delaunay, November 1991-February 1992, p. 133, no. 81 (illustrated). In the years before his untimely death in 1941, Delaunay shifted his interest from easel painting to architecture, experimenting on murals and three-dimensional supports. Four years after the present work was executed, the artist participated in the last large-scale international exhibition--Arts et Techniques, held in the Palais des chemins de fer--in Paris before the war. Bold and innovative, Relief Rythme prefigures the magnificent reliefs that would adorn the pillars of the railway station's entry hall (fig. 2). (fig. 1) The summation of Delaunay's mural art--the lobby of the Palais des chemins de fer at the 1937 Arts et Technique exhibition. In the background, his monumental panel Air fer eau and decorative reliefs are visible. (fig. 2) Close-up of one of the entry hall's pillar reliefs. (fig. 3) The artist standing in front of another painted relief, 1937.